Warm, Sunny Days …. and Worms! – Life's Hard Wine Helps! Well the Borders Book Festival is over and everything is packed away until next year. The weather stayed dry and sunny, which is rather nice because one year when I was there the heaven’s opened and it poured with rain all day. You will recall I had six copies of Divorcees.Biz on sale in the Festival Bookshop. They were simply on the counter with hundreds of other books. I really didn’t think anyone would buy a copy as all the big named authors were speaking at the event and were all doing book signings. Nevertheless three copies were sold, so I was really quite delighted about that. Tomorrow, with a bit of luck, I am going to Newcastle with my friend. We are going to spend a few hours looking at the shops and then finishing up in the M&S Deli Bar in the food hall. Okay, I know I have told you this before, it is really wonderful chilling out in there with a glass of wine and a light lunch, before we both rush back to the bus stop for the bus home to Kelso. We can’t miss it, because it is the only one going all the way back up to Jedburgh where we have left the car….. On the other hand – I have just had a lovely thought here – if we missed the bus we could spend the night in one of the motels on the Quayside and then do the whole thing all over again the next day. Note to myself – must speak to Helen about that!! Meanwhile all else is much the same here in Kelso. Except for the streets, which have been in an uproar for the last few months, and are still in an uproar. Traffic lights, cones and lots of red barriers are all over the place. To tell you the truth I have no idea why it is taking so long. Okay the pavements are being relaid and no doubt they are looking better, but did they really have to have every streetin turmoil at the same time? But there must be more going on than new paving slabs being laid. Outside the Town Hall, right in the very heart of this lovely town, there is now a deep trench and, what looks like, new, green, concertina pipes are being laid. Or else there is one enormous green worm down there. Well everyone, now that I have frightened the lives out of you, I am going to close and try to pick up the threads of the sequel to Divorcees.Biz. 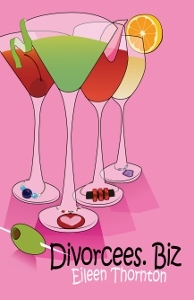 Don’t forget, Divorcees.Biz can be found on Amazon UK and Amazon.com. It’s a light-hearted, fun book to read while you are enjoying the sun, sand, sea and……. ice-cream. 🙂 Now what did you think I was going to say? ?